Home » Decor & Design » Other » Brass Hardware Makes a Comeback! If you have old dated brass hardware that you have been dying to replace, you may want to take a moment to rethink that idea. Turns out that old brass hardware may not be viewed as dated any longer. Why, you say? Well, just as with many things in life, what’s old is once new again. That’s right! Brass hardware is making a comeback, and in a big way. Luckily, it is being incorporated into many different design styles. Notice this farmhouse kitchen (above). Not only has the rule of consistent hardware been thrown out the door (i.e. 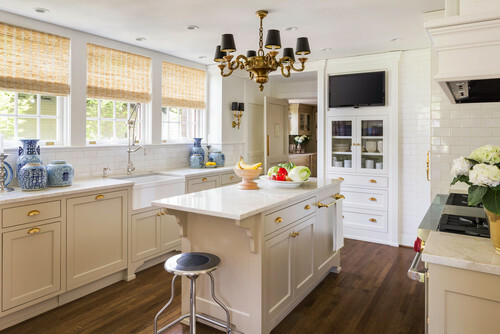 the colored knobs on the top drawers combined with the other brass hardware), but also this homeowner has chosen to go with lighting fixtures of a different finish as well. 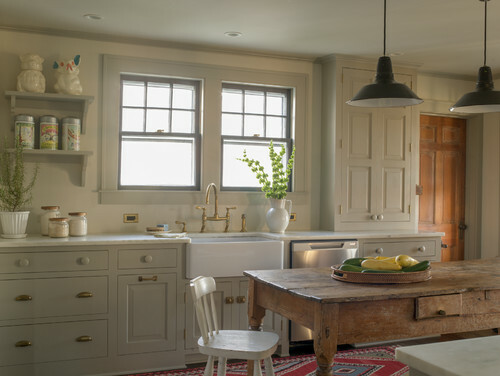 Here, this transitional kitchen looks very good with its “dated” brass hardware and fixtures, as well. You’ll notice that they too have mixed metals — brass pulls and lighting mixed with a satin faucet and seating. Yet, the combination works. This mixed metal theme has also been utilized in this Victorian home. 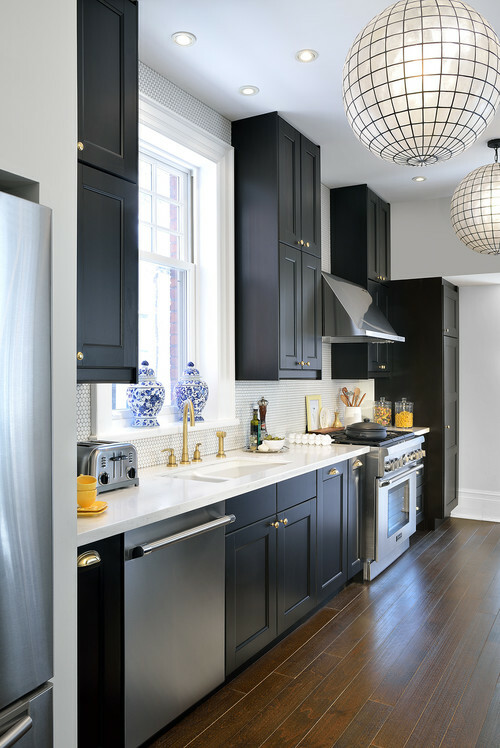 Because the stove has brass hardware (to keep the look of an old Victorian home), the home owner has added a brass faucet to help pull this look together. 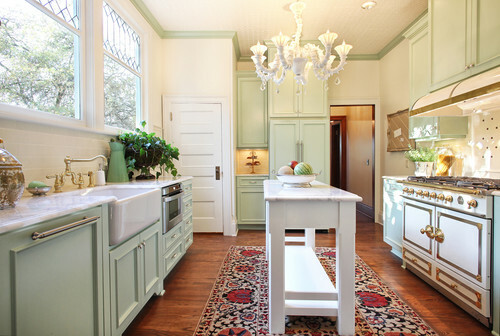 However, that did not stop them from using satin knobs and pulls on the cabinetry. 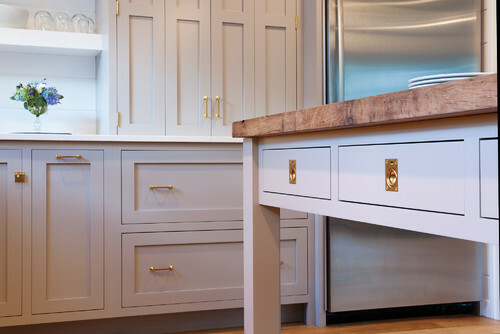 If you are wondering how brass hardware would work with a darker cabinet or a sleeker style, well take a look at this french bistro inspired kitchen. This combination is one of my favorites — brass mixed with stainless steel on a black and white background. The same theme also works well in a bathroom. Here, brass faucets have been added to the oil rubbed bronze hardware. We do, however, see just a tinge of the brass color peaking through on the mirror frame. 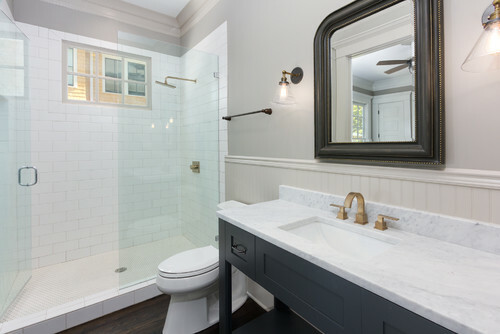 In this Contemporary styled bathroom, brass has been given a place of prominence. Not only has this home owner chosen a faucet in this finish, but you will notice that they also have plumbing in a matching finish. I do like the added touch of the polished chrome sconces, though. As you can see, brass doesn’t have to be the eyesore of a home’s existence. 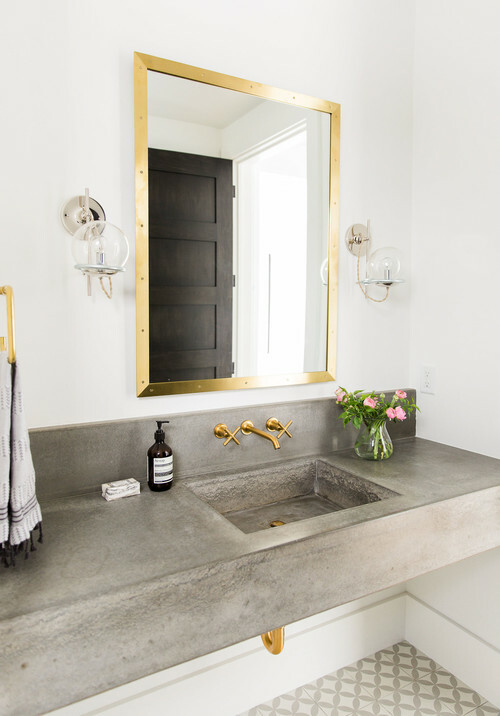 So, if you’re wishing for a more modern looking kitchen or bath, perhaps you can forego buying all new hardware and instead opt for polishing up that old brass that you already have.